With Email migration, you can copy emails from one email account to another account that is created on the domain hosted with One.com. You can migrate both from external accounts, like Gmail, Hotmail and Yahoo, as well as internal accounts that are hosted with One.com. Both emails and folders are migrated. The emails are placed in a folder with the name of the account you are migrating from. 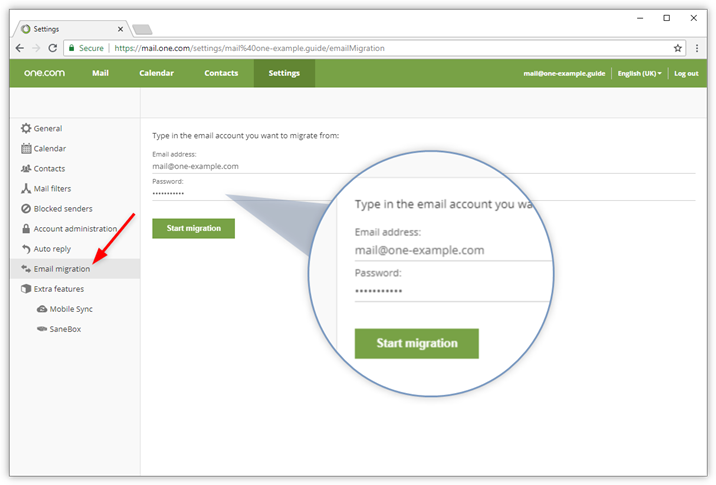 Log into Webmail with the account you want to migrate the emails to. Click Settings in the menu at the top of the screen. Click Email migration in the menu to the left of your screen. Enter the email address and corresponding password, that you want to migrate from. For some providers, for example, Outlook and Gmail, you will be automatically redirected to a secure login page and requested to allow the migration tool access to the account. The migration is now in progress. It can take up to 2 days before it is completed. While the migration is in progress the folder from the migrated account is already visible, but it won't have all your emails yet. Tip: If you are on a mobile or tablet; tap the menu in the top left corner. Next tap Mail, also in the top left corner and then Settings. Tap the 2 arrows in the settings menu to open the migration tool. Where are my emails placed? The emails (and folders) are placed in a folder with the name of the account you are migrating from. The folder gets created automatically when you start the migration. When the migration is done, you can move the emails and folders to other locations on your account. Can I migrate emails from the same account? No, this isn't possible because both accounts need to be active to start the migration, and an account cannot be active in two places. If you want to migrate emails during a domain transfer, we recommend setting up your account with IMAP in a local client and making a backup there. Will emails be removed from the account I am migrating from? No, the emails get copied. Nothing changes on the account that you are migrating from. From which email providers can I migrate emails? You can migrate from most email providers, except iCloud and Bluehost. It seems that not all my emails were migrated. If emails or folders are missing, this usually means that the migration hasn't been completed yet. Go to Settings > Email migration to see if it's still ongoing. How many email migrations can I do? You can migrate as many mail accounts as you want, but only one at a time per email account. Once the migration is completed, you can start another one.